Using recent data drawn from the European Working Conditions Survey for 32 European countries, we explore the relationship between country-level expenditures on R&D, Intellectual Property Rights (IPR), and individual-level entrepreneurial performance as measured by earnings. Our results show that both R&D expenditures and IPR are positively associated with earnings (and hence the quality) of individual entrepreneurs. However, we also find an intriguing moderation effect in the sense that IPR reduces the positive relationship between country R&D and entrepreneurial earnings. This suggests that too strict IPR legislation may hamper the diffusion of knowledge created by R&D. Hence, governments need to carefully consider the level of IPR they want to install, especially in countries with high R&D expenditures. All authors contributed equally to the manuscript. The authors would like to thank Andrew Burke, the guest editors—Maribel Guerrero and David Urbano—, and two anonymous reviewers for their insightful comments that contributed substantially to the development of this paper. This paper is part of Serhiy Lyalkov’s doctoral dissertation, which has been written under the framework of the PhD Program in Economics, Business, Finance and Computer Science at the University of Huelva and the International University of Andalusia, Spain. This work was supported by the Spanish Ministry of Economy and Competitiveness (Ministerio de Economía y Competitividad) under Grants number ECO2017-86305-C4-2-R and ECO2017-86402-C2-2-R; Regional Government of Andalusia (Junta de Andalucía) through Research Group SEJ-487 (Spanish Entrepreneurship Research Group—SERG); and University of Huelva through Research and Transfer Policy Strategy (Estrategia de Política de Investigación y Transferencia) 2018. Average net earnings in recent months. The variable is defined in PPP $ of 2015 and converted to natural logarithms. Gross Domestic Expenditure on R&D by business enterprises, higher education institutions, as well as government and private non-profit organisations. Data for periods 2010 and 2015 are used. The variable is expressed as Purchasing Power Standards—PPS—per inhabitant at constant 2005 prices (Data source: Eurostat). Intellectual Property Protection indicator. Data for periods 2010 and 2015 are used. The variable is evaluated on a scale of 1 to 7, from extremely weak to extremely strong protection (Data source: World Economic Forum’s Executive Opinion Survey). Dummy equals 1 for observations corresponding to countries which’ IPP is above 4.62, this benchmark being the unweighted average IPP for the 32 countries in our sample during the periods 2010 and 2015 (Data source: World Economic Forum’s Executive Opinion Survey). Dummy equals 1 for workers who declare being self-employed with employees. Dummy equals 1 for workers with less than lower secondary education (ISCED-1997, 0–1). Dummy equals 1 for workers with, at least, lower secondary education but non-tertiary education (ISCED-1997, 2–4). Dummy equals 1 for workers with tertiary education (ISCED-1997, 5–6). Years of experience in the company or organization. Dummy equals 1 for workers whose code of main activity of the local unit of the business, by means of the Nomenclature of Economic Activities (NACE rev. 2, 2008) is A = Agriculture, forestry and fishing. Dummy equals 1 for workers whose codes of main activity of the local unit of the business, by means of the Nomenclature of Economic Activities (NACE rev. 2, 2008) are B = Mining and quarrying, C = Manufacturing, D = Electricity, gas, steam and air conditioning supply, and E = Water supply; sewerage, waste management and remediation activities. Dummy equals 1 for workers whose code of main activity of the local unit of the business, by means of the Nomenclature of Economic Activities (NACE rev. 2, 2008) is F = Construction. Dummy equals 1 for workers whose codes of main activity of the local unit of the business, by means of the Nomenclature of Economic Activities (NACE rev. 2, 2008) are G = Wholesale and retail trade; repair of motor vehicles and motorcycles, and I = Accommodation and food service activities. Dummy equals 1 for workers whose code of main activity of the local unit of the business, by means of the Nomenclature of Economic Activities (NACE rev. 2, 2008) is H = Transportation and storage. Dummy equals 1 for workers whose codes of main activity of the local unit of the business, by means of the Nomenclature of Economic Activities (NACE rev. 2, 2008) are K = Financial and insurance activities, and L = Real estate activities. Dummy equals 1 for workers whose code of main activity of the local unit of the business, by means of the Nomenclature of Economic Activities (NACE rev. 2, 2008) is O = Public administration and defence; compulsory social security. Dummy equals 1 for workers whose code of main activity of the local unit of the business, by means of the Nomenclature of Economic Activities (NACE rev. 2, 2008) is P = Education. Dummy equals 1 for workers whose code of main activity of the local unit of the business, by means of the Nomenclature of Economic Activities (NACE rev. 2, 2008) is Q = Human health and social work activities. Dummy equals 1 for workers whose codes of main activity of the local unit of the business, by means of the Nomenclature of Economic Activities (NACE rev. 2, 2008) are J = Information and communication, M = Professional, scientific and technical activities, N = Administrative and support service activities, R = Arts, entertainment and recreation, S = Other service activities, T = Activities of households as employers; undifferentiated goods- and services-producing activities of households for own use, and U = Activities of extraterritorial organisations and bodies. Dummy equals 1 for females. Dummy equals 1 for citizens of a different country from that of residence. Age reported by the workers. Dummy equals 1 for individuals cohabiting with spouse/partner. Dummy equals 1 for individuals cohabiting with any son or daughter aged under 14. Variable ranging from 1 to 5. The scale refers to the level of health declared by the worker. It equals 1 for individuals whose health is very bad and 5 for individuals whose health is very good. National annual unemployment rate for periods 2010 and 2015 (source: Eurostat, World Bank). Dummy equals 1 for observations corresponding to the EWCS 2015 and 0 for observations corresponding to the EWCS 2010. 32 dummies equaling 1 for individuals living in the named country: Austria, Belgium, Bulgaria, Croatia, Cyprus, Czech Republic, Denmark, Estonia, Finland, France, Germany, Greece, Hungary, Ireland, Italy, Latvia, Lithuania, Luxembourg, Malta, Netherlands, Norway, Poland, Portugal, Romania, Serbia, Slovakia, Slovenia, Spain, Sweden, Switzerland, Turkey and the United Kingdom. Eurofound (2012). Fifth European working conditions survey—overview report, publications office of the European Union, Luxembourg. https://www.eurofound.europa.eu/sites/default/files/ef_publication/field_ef_document/ef1182en.pdf. Accessed 1 Apr 2019. Eurofound (2016). Sixth European working conditions survey–overview report, publications office of the European union, Luxembourg. https://www.eurofound.europa.eu/sites/default/files/ef_publication/field_ef_document/ef1634en.pdf. Accessed 1 Apr 2019. Eurofound (2018). European working conditions survey integrated data file, 1991–2015. [data collection]. 7th edn. UK Data Service. SN: 7363. http://doi.org/10.5255/UKDA-SN-7363-7. European Commission (2017). The economic rationale for public R&I funding and its impact. Brussels: European Commission. https://ri-links2ua.eu/object/document/326/attach/KI0117050ENN_002.pdf. Accessed 1 Apr 2019. Hall, B. H., Mairesse, J., & Mohnen, P. (2010). Measuring the returns to R&D. In B. H. Hall & N. Rosenberg (Eds. ), Handbook of the economics of innovation (Vol. 2, Chapter 24, pp. 1033–1082). https://doi.org/10.1016/S0169-7218(10)02008-3. Krieger, B., Licht, G., & Pellens, M. (2018). New perspectives in European innovation policy. ZEW policy brief, No. 7/2018. Mannheim: Zentrum für Europäische Wirtschaftsforschung (ZEW). http://hdl.handle.net/10419/183222. Accessed 1 Apr 2019. OECD (2018). Gross domestic spending on R&D (indicator). http://dx.doi.org/10.1787/d8b068b4-en. Accessed 1 Apr 2019. Thompson, M.A., & Rushing, F.W. (1996). An empirical analysis of the impact of patent protection on economic growth. Journal of Economic Development, 21(2), 61–77. http://jed.or.kr/full-text/21-2/4.pdf. Accessed 1 Apr 2019. Thompson, M.A., & Rushing, F.W. (1999). 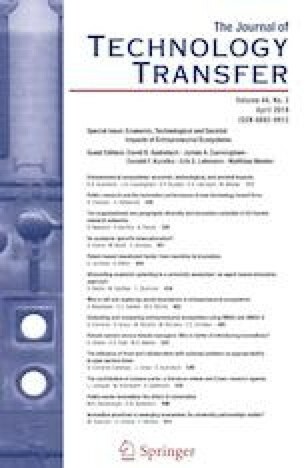 An empirical analysis of the impact of patent protection on economic growth: An Extension. Journal of Economic Development, 24(1), 67–76. http://jed.or.kr/full-text/24-1/thompson.PDF. Accessed 1 Apr 2019.